HOLDEN BEACH – Holden Beach commissioners are withdrawing the town’s permit application to build a terminal groin at the east end of the barrier island. During their regular meeting Tuesday night, board members unanimously voted to permanently revoke the town’s application with the Army Corps of Engineers. 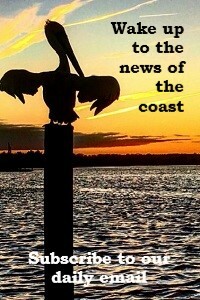 Commissioners have concluded that, “the total costs to the Town, its citizens and visitors of the proposed Lockwood Folly Inlet Terminal Groin greatly outweigh the potential benefits thereto, both financially and otherwise,” according to a resolution they unanimously adopted following their vote to revoke the application. Commissioners directed attorney Clark Wright, a special environmental lawyer hired last December by the board, to notify the Corps of Engineers of the board’s decision to “withdraw fully and cease any and all further processing of, or action on” the permit applications and associated National Environmental Policy Act, or NEPA, documentation. The North Carolina Coastal Federation, publisher of Coastal Review Online, has been against the terminal groin since it was first proposed. The federation noted in a press release that its opposition to terminal groins and similar hardened structures is because of the threats they pose to public beach access and natural habitat for endangered or threatened species, including sea turtles and shorebirds. The town has spent nearly seven years and more than $600,000 on studies examining various ways to mitigate severe erosion at the Lockwood Folly Inlet. 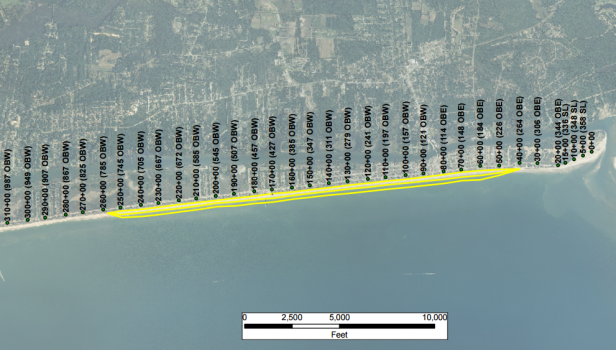 The final Environmental Impact Statement, or FEIS, a study prepared by coastal engineers hired by the town and released by the Corps last month, identified a 1,000-foot-long terminal groin as the preferred erosion-control method. At the close of the meeting, Commissioner John Fletcher said everyone on the board thoroughly researched the environmental studies before making the decision to revoke the permit application. 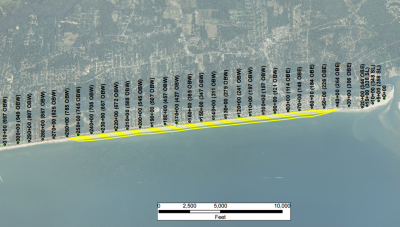 Engineers with Applied Technology and Management Inc., or ATM, identified a 700-foot-long terminal groin with a 300-foot-long shore anchorage system as the preferred alternative to shoreline erosion control at the island’s east end. Fran Way, a senior coastal engineer with ATM, said earlier this month that the town would save $12 million over 30 years if it builds a terminal groin. During that April 6 meeting, Way encouraged commissioners to move ahead with obtaining the permits. O’Neal Varnam, a Brunswick County resident who has been coming to the island for decades, asked commissioners Tuesday night to proceed with the proposed groin project. Opponents of the terminal groin have argued that the estimated $34.4 million cost associated with construction, maintenance and routine sand injections needed to supplement the structure over 30 years is too high a price tag to protect what would equate to protection of a handful of homes at the east end. Several people who spoke during the April 6 meeting about the FEIS said the town would be better off re-nourishing the beach. 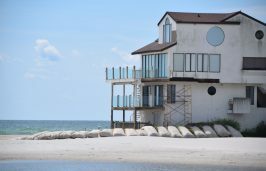 The town has been routinely pumping sand onto the eastern end of the 8.1-mile-long barrier island for 50 years. 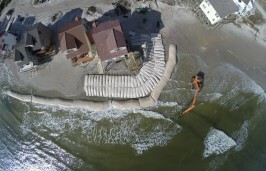 Sandbags have also been placed along the shore throughout the years as a temporary means to protect homes and properties. About a year ago, the town completed the first phase of its $15 million Central Reach project, which pumped about 1.3 million cubic yards of sand along about a 4-mile stretch of oceanfront in the middle of the island. 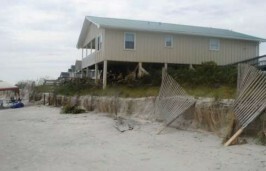 Ronda Dixon lives on an oceanfront lot at the east end. If the town had proceeded with building a terminal groin, the structure would have been built on a portion of her property. “But at that time my hope is that they will start from scratch and look at updated data,” she said. 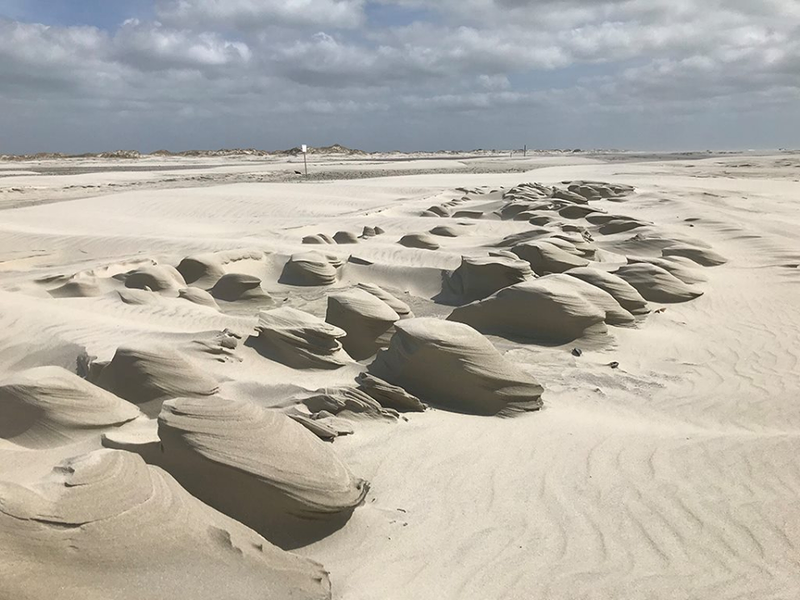 Holden Beach is the first North Carolina beach town to formally revoke its permit application to construct a terminal groin since the General Assembly in 2011 repealed a decades’ old law banning coastal hardened erosion control structures. The law allows for the construction of up to six terminal groins along the coast. Bald Head Island is the only beach town in the state to build a groin since the 2011 repeal. Figure Eight Island, a private barrier island in New Hanover County, got as far as seeing through the completion of an FEIS that identified a terminal groin as the preferred alternative at Rich Inlet. Property owners voted down the proposed project. Ocean Isle Beach’s plans to build a terminal groin have been on hold since August when a lawsuit challenging that town’s FEIS was filed by the Southern Environmental Law Center on behalf of Audubon North Carolina. North Topsail Beach in Onslow County is in the early stages of studying erosion-control alternatives at New River Inlet. Coastal engineer consultants hired by that town said that the preliminary preferred alternative to mitigate erosion at the northern end of town is a 2,000-foot-long terminal groin.